Those words by bride-to-be, Nicole Steakley, pretty much summarize her “boy-meets-girl” story with fiancé, Hiten Iyer. Two years after that first date, their Santa Barbara beach engagement session (featured in the anniversary issue of Nouveau magazine) takes that cinematic romance to another level and was captured skillfully by photographer Lacie Hansen. 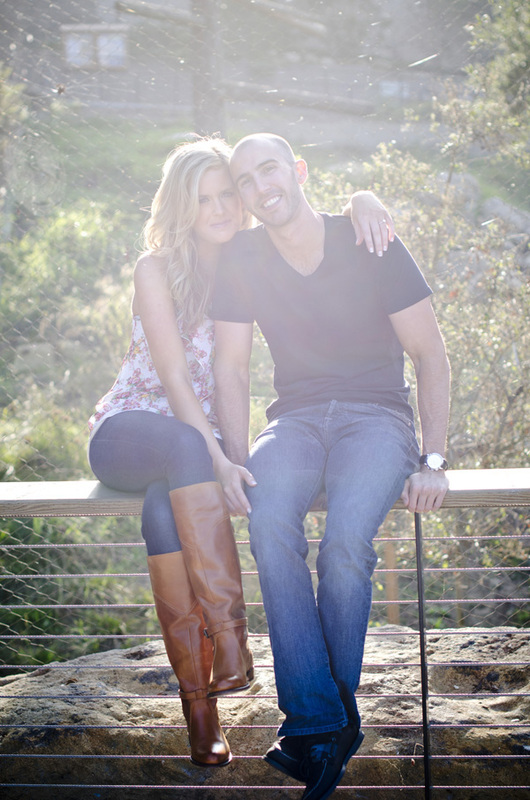 NICOLE: Hiten and I had planned a weekend away in Ojai for our two year anniversary. After our time there and on our way back to Santa Barbara, where we live, we decided since it was one of the most beautiful days ever…to take a hike up to Saddle Rock. This hike is one we used to take frequently when we first met. We loved it because once you reach the top, it is has the most amazing 180 degree views of the Santa Barbara coastline. It was also here, where we first talked about getting married two years ago, just a few days after we had met. So, on our two year anniversary it was here at “our spot” where Hiten asked me to Marry him. Little did I know, that in the weeks leading up to this day, Hiten had hiked this trail a few dozen times timing exactly how long it would take to get up to “our spot” & get back down, and most importantly in search of a secret shooting rock close by. A few months before the proposal, I had mentioned how cool it would be to have a secret photographer hiding & taking snapshots of the proposal, capturing such a special moment. Hiten completely dismissed it as “the stupidest thing ever”, but I guess he remembered how much it mattered to me when our time came. Hiten had been in talks with my dad, who is a world class outdoor & adventure photographer, and they had devised a plan. From “our spot” above, we had an amazing view of everything, EXCEPT the hidden photographers, my dad with his telephoto lens & camera & Hiten’s best friend with his video camera, who were crouched far below, behind a rock & makeshift shrubs they had put up to hide behind. We have secret pictures and a video of the whole thing!! I had no idea of the secret photographers until we were headed back down the mountain, in a joyful daze. As we came around a bend, out jumped all of our closest friends, and both of our families, including my dad & Hitens best friend capturing the whole thing! I was completely shocked Hiten had coordinated our decent from the mountain to coincide with our families and friends surprising us in a small pasture at the head of the trail. I had NO idea that any of this had been planned & was overjoyed to see all of the people we care about the most here to celebrate the proposal! While Hiten was proposing, our friends & family had all set up a lavish feast of wine & cheese & ceremonial Indian auspicious foods. Hitens parents had also prepared garlands of flowers and a small alter, where we had an Indian “Puja” or ceremonial celebration. After tons of congratulations, hugs and kisses, toasts, we all went to a small bistro in Montecito to celebrate! The whole experience was absolutely wonderful from beginning to end & I am so happy we have photos & video to remember it forever! NOUVEAU: Project ahead to your one year anniversary, or five or ten year? What does it look like? What do you hope to have learned as a couple? NICOLE: In the years to come we can’t wait to start a family, grow & learn together. To share not only the big milestones but also be able to enjoy & savor all the small everyday moments. As a couple, we have begun to learn how to respect each others opinions, and choices. In the future we want to continue working on embracing these differences, whether they be cultural, or personal, and fold both of our life experiences & backgrounds into our children’s lives. HITEN: I have learned how important family and community is, and have realized how incredibly lucky we are to have such a supportive network of people around us. My ultimate hope is that our children can share in the love & joy we’ve found within each other and through our families and communities. In five years we hope to have a vow renewal celebration and bring everyone from our upcoming wedding back together. Only this time somewhere tropical! With a september wedding in store, we’re on the edge of our seats to see all the details. Congratulations to the lovely couple. Featured on OnceWed with Jose Villa! Biltmore Wedding Featured on Style Me Pretty!! Get ready for the most gorgeous, most quintessential Santa Barbara wedding you’ve ever laid eyes on. We’re talking a pretty lace dress, loads of fluffy white florals, pink and blue touches and the prettiest Spanish architecture ever. Yup, we’re totally smitten with this one! Michelle Warren Photography captured all the classic details and there’s SO much more where this came from. Click here for all the pretty! From the Bride… Rob and I met on Valentine’s Day 2009 at a good ol’ Texas honky tonk/dance hall in Houston. He and his buddies were handing out candy bracelets in exchange for a dance. I have to admit, I saw straight through the cheesy pick-up attempt, but boy, am I so glad I said yes to that dance! A short (and sweet!) three years later, we were engaged. We were both born and raised in Dallas, Texas. It wasn’t until high school that my family moved out to Bakersfield, California – much of my family is still in Bakersfield or in the San Luis Obispo area. Most of Rob’s extended family is in Chicago or scattered up and down the east coast. We knew that any location we chose would be a destination for someone! We decided on Santa Barbara because it’s the most beautiful place on the planet – seriously, jaw-droppingly gorgeous. As it turned out, we both have ties to the Santa Barbara/Montecito area. After my family relocated to Bakersfield, Santa Barbara quickly became a favorite vacation spot. Rob’s mom has many family members who live or have lived in the Santa Barbara/Montecito area. Needless to say, the stars were perfectly aligned. The Biltmore was my first and final stop. Once I stepped foot onto the property, I knew I wanted our wedding to have that Spanish colonial elegance that the Biltmore so perfectly exudes. The bright, bold colors of Spanish tiles instantly became the inspiration for our color scheme and invitation suite. Ultimately, we used Santa Barbara itself as inspiration for the design –the lush greenery, beautiful beaches, breathtaking sunsets, and overall amazing-ness that makes it such a magical place. Engagement Session Featured on Something Turquoise! My best advice is to take your time and ENJOY the wedding planning process. We started planning 15 months in advance, so we never felt rushed to choose our vendors or to book everything at once. Because of this we were able to choose the best vendors. In my opinion this is the secret to end up with the wedding of your dreams! Whenever you get overwhelmed or stressed out, take a step back and remind yourself that your wedding day will be the best day of your life and everything you have ever dreamt it to be. (Trust me, it really will be!) All of the planning is definitely worth it when I think back to our wedding day. I can honestly say I wish I could do it all again…and again. The Ceci New York creative process was by far the most exciting and rewarding part of our wedding planning! Custom invitations give you a glimpse into what your wedding will look and feel like before your big day. Ceci turns all your wedding dreams and ideas into an inspiration board and from there creates the most beautiful interpretation of your wedding through her custom invitation designs. She truly is a designer, and there is no limit to what Ceci can do. She even had the ruched tulle bellybands hand-sewn for our invites! Plus, she keeps the whole design process so organized by creating a timeline she really sticks to. As for the final product, every little detail on the invites was perfection and of the highest quality. The paper and the letterpress was out-of-this-world gorgeous! To say that our invitations were perfect is an understatement!